PHOTO BY JUSTIN BORUCKI Led by Rob Halford (center), Judas Priest brings "Firepower" to its fans at Darien Lake on Wednesday, September 5. 7 p.m. | $35.25-$152.43 | darienlake,com; judaspriest.com. Judas Priest has arguably been the backbone of heavy metal. Established in 1969, the group achieved platinum-record status a decade later with "Unleashed in the East." In the years since, it has released even more successful albums, including its latest, "Firepower," which marked the group's highest-charting record ever on the Billboard 200 albums chart. At the core of the band is frontman Rob Halford, who is often referred to as the "Metal God." As burdening as that nickname sounds, it suits him. Halford's voice is supreme, and Judas Priest is the band with the definitive metal songs. Halford is an iconic figure, known for his studded, leather attire and penchant for riding motorcycles onstage. 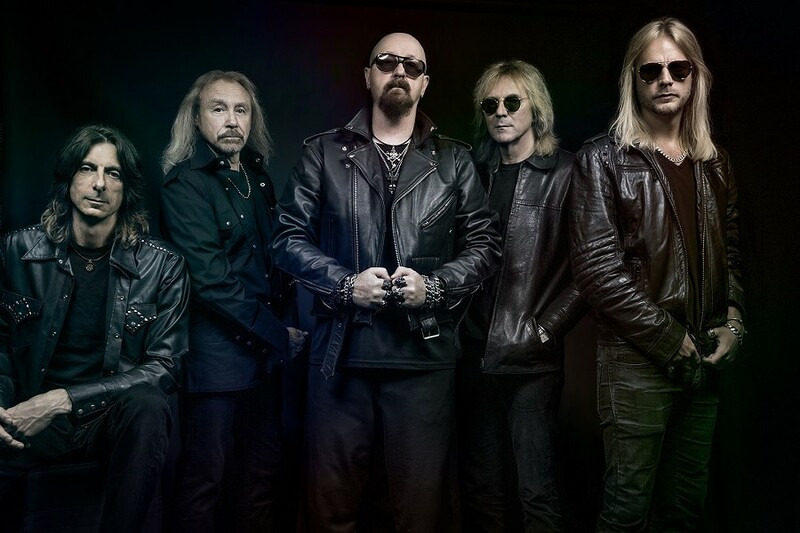 Halford's coming out as gay two decades ago has long been a part of the group's mainstream identity, and its enduring presence has been unbowed by setbacks like guitarist Glenn Tipton's recent Parkinson's Disease diagnosis. The group continues to rock on, and Halford himself keeps a vital presence that includes an Instagram account, where he occasionally posts whimsical selfies. Judas Priest is playing at Darien Lake Amphitheater on Wednesday, September 5. In a recent interview during a tour break, Halford was warm and gracious as he discussed the music, human rights, and his own Christianity. An edited version of the interview follows. CITY: What keeps you going? Rob Halford: It's the music, first and foremost. That's the driving force for me in my life, and I think it's the same for everybody in Judas Priest. You wake up each day with endless possibilities, and when it comes to music, it's a constant adventure. It's always evolving, and you never quite know where it's going to take you. It's exciting, no matter where you end up. It's the thrill of being a musician who is still active and working. We're on this big massive world tour with our new album "Firepower," which is probably going to go on for a couple of years, so that completes the picture as well. How do you take care of yourself while you are out on the road? Like protecting your hearing, for example? For me, there was a bit of a revolution when in-ear monitors were invented. When you're a singer in a band, you're fighting to break through and hear yourself as well as everyone else. Floor monitors never gave me the best experience as a singer, and I would find that I was singing in a way that was more about trying to hear myself than anything else. When in-ear monitors were invented, it was like an epiphany, because you could hear yourself on stage as well as you could in the studio. So that was a lifesaver for me, because that means I have been able to take care of my voice a lot better now. Beyond that, it's just been sensible. When you go out on stage, you have a responsibility to not let your fans down. All my partying days - although I still like to party - ended about 32 years ago, and I've made the necessary adjustments to make sure that I can do what's expected of me. Judas Priest strikes me as a band with tons of great songs. Has the band ever set out to write hits? That was never important to me until we came to America, and we saw the glorious power of rock 'n' roll radio. Even now, one of our biggest thrills is to come into town, turn on the radio, and hear our music. We love that side of what we do. But having said that, I don't think we've ever really with determination said, "Let's write a song for radio," because essentially, we're a heavy metal band. One of our biggest songs, "You've Got Another Thing Coming," was buried in the album "Screaming For Vengeance." At that time we were back in England, and when we heard from the label that it was making waves on the radio, we were thrilled. The hits have happened, but it was pretty much out of our control. It's just when the components fall into place you sometimes get lucky. How do you see the new album fitting into the Judas Priest catalog? It's been absolutely amazing. I want to thank all of our fans for giving us the great success for "Firepower." It's gone way over the top as far as what we ever anticipated. You never know what's going to happen with your music. In your mind, you can think you have written the greatest song or greatest record, and for whatever reason, it doesn't touch people. That's not been the case with "Firepower." I think there's been a lot of re-investigating of Judas Priest, and we've been at the right time and right place with the songs. So this is already becoming a Priest classic, and it's only been out for a few months. What's the most unusual place that a Judas Priest song has been played? We're going to Jakarta, Indonesia, this year, and President Joko Widodo is a huge heavy metal fan. So that just shows you how this style of music has become such a global force. If you would have asked me 30 years ago, I would have said places like Indonesia or Iran or Iraq, places that on the surface you wouldn't think would be hearing or be able to hear that kind of music. Now you can go anywhere in the world and find a heavy metal maniac, and it's thrilling to know the power of heavy metal has touched every place on the planet. What has been one of the most flattering things that has happened to you since you've become famous? I'm a really simple guy. I don't know. Ever since the "British Steel" years, the fans started to give me this title the "Metal God," which is extremely flattering and makes you think more about who you are and what you're trying to be and do with your music. At any moment when you're recognized, like when you get a Grammy, that's tremendously flattering. These are all extras that you never even dream of, and there's been quite a few over the years. It makes you feel good. It makes you work harder and try harder. I've read that you have some collaborations in the works. Would you ever consider writing songs from a different lyrical perspective, like writing political songs or stepping out of your metal comfort zone? I could do that, and I never say never. I think if you're a musician, there's a great open field of opportunity. But when you walk into that world of politics, you really have to be sure and committed about making that kind of a move. I have some good friends that make those kinds of songs, and it takes a lot of strength to maintain your platform in some of those areas. If you listen to Priest songs and you look at Priest lyrics, there are references all over the place that could be a smoke screen, in a political sense. But I'm not really an activist. Some days I wake up and I think I should be, especially being a gay metal head and knowing that there are still all of these injustices against people like me. But at the same time, when I stand on stage in Saint Petersburg in Russia, that's a victory for gay people. Sometimes you don't have to say anything. You just stand there and people go, "I know exactly what you're thinking right now standing on that stage." Some of the greatest leaders in that realm have been very quiet and low-key. The volume around a person isn't necessarily loud. It's just you have to look at an individual and know what they represent. You released a Christmas album in 2011 featuring a beautiful rendition of "O Holy Night." Are you a Christian? Yes, that's the label I have to stick on myself, because I am. But I don't really like organized religion. The spiritual faith to me, it is what it is, and just because there are certain elements of my spiritual faith that are more directed towards Christianity, that's probably what I am. That's important to me on a day-to-day basis. Is 2019 the year that Judas Priest gets inducted into the Rock and Roll Hall of Fame? I don't know. I hope so, and I think we will one day. I just hope we will while we're alive, because I want to go there. When that day comes, I want to be there, and I want to be jumping, yelling, screaming, and shouting with joy for Judas Priest and heavy metal.